When you have adult children living and working in different countries, and you wish to see them…like I do, you travel to them. In this case, Berlin Germany. I’d never been there, in fact, up until a year ago the only other country that I’d visited had been our good neighbors to the north, Canada. Our daughter Macy has lived in Berlin for eight months. I hadn’t seen her since we dropped her off at the airport last summer. It was a tough moment for my wife and I. Here was our “baby”, little Macy Sue…all twenty years of her…flying off to be an Au Pair in Germany. My wife and I would finally be “real” empty-nesters. Our girls would all be quite a ways away. Jordan in Miami, Karalee in Japan and now Macy in Berlin. Needless to say our mood during the ride home from the airport and subsequent evening were “subdued”, almost in mourning. Our kids….gone. We missed them already. 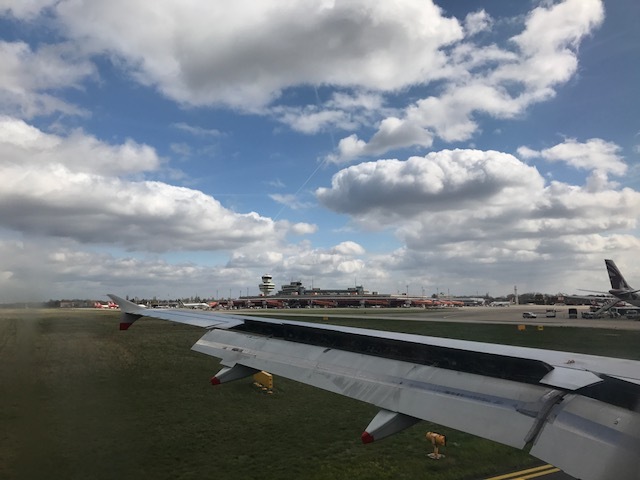 It was decided that my best option would be to buy a one-way ticket for a flight leaving Chicago and arriving in Berlin from Air Berlin. I bought a ticket that way, BUT it wouldn’t use the front end of a connecting flight from Paris to Berlin so I called Expedia.com to see if I could still use the back-end of the return flight Berlin to Paris when I wanted to return home. Literally an hour and a half on hold with them and I finally reached a person who could tell me “no”, I could not do that. Airline policy prohibits it. So, at three in the morning of my departure I purchased a one-way ticket from Berlin to Paris to hook up with my return flight. Done deal. I’m good to go! After arriving at my starting point at the Cedar Rapids airport (at 4:30 AM) I received an email from Air Berlin that my Chicago to Berlin flight had been cancelled overnight, less than twelve hours after I had purchased it, (I was really, REALLY getting anxious and irritated at this point) BUT the email went onto read “American Airlines picked up the flight, with a transfer to British Airways in London.” Thank God!! The trip was still “on”. My Cedar Rapids to Chicago flight was just fine, I had a twelve-hour layover at O’Hare. Once you’ve spent time in a big airport terminal, that’s pretty much enough. I’ve been there several times and appreciate its amenities, though pretty much just waited until my 5:25 PM boarding time. My flight from Chicago to London went well. We flew overnight. I caught a glimpse of the northern lights, which I hadn’t seen since I was a kid growing up on a farm….and I didn’t sleep a wink. I usually don’t sleep on airplanes, even though it’s not because I’m nervous or anxious. My day began at 2 AM and it’d be a long, long “day”. Arriving at one terminal and needing to get to another terminal of a huge airport. Need to find the shuttle/tram/bus to get to that terminal. Go through security again. (my tiny tube of Crest toothpaste was eyed closely) AND I received a complimentary pat-down in the home of some of my ancestors. Fortunately I researched the whole “how to get from Terminal 3 to Terminal 5” question while I was sitting in O’Hare for twelve unremarkable hours and found the shuttle easily. 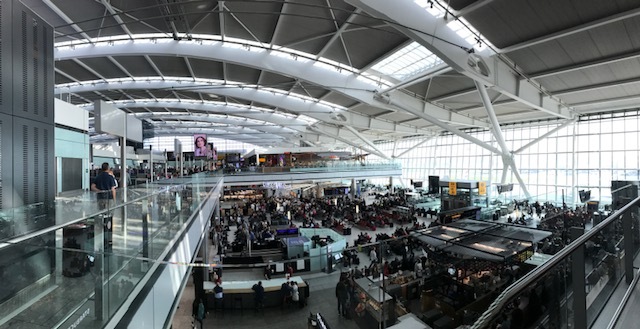 Terminal 5 at Heathrow is really nice. I was told that the information desk that I was looking for was “down there in the middle.” Do you see it? Yeah…neither did I when I walked around down there. Those danged Brits and their dry sense of humor. As with many of my trips I try to gather as much information as I can to ease through airports and such. Sometimes it works, sometimes you just go on faith that it’ll work out. I’ve found that being polite, patient and courteous go a long way when asking for information when out of the States. (I can spot Americans at foreign airports, they’re the ones being loud). While waiting for my British Airways flight I struck up a conversation with a fellow American from Joliet Illinois. She was traveling to see a sister in Germany and we had a good laugh about the different things just between the English and Americans. Our flight to Berlin was boarding so we wished each other a good trip and settled into the (quite) nice British jet. Once on the ground in Germany, the Tegel airport in Berlin is rather old. They’re building a new airport but it’s not in use as of yet. Holy smokes!! England and now Germany, plus I got to see the English Channel. I got a window seat since I’m a big shot in the States. True story. Once I was off the plane I got in line to have my passport checked. Honestly…the guy really gave me a once, then twice over. Perhaps he was just super impressed to have ANOTHER American enter his country OR that he recognized me from Facebook, regardless he stamped my passport with the authority of a LeBron James slam dunk and handed my passport back. Customs! It’s where they really, REALLY go through what you could possibly be bringing into their country. Since I fly standby I travel very light. Small suitcase that holds a couple of days worth of clothes and a small backpack. I read their customs sign carefully, slowly, making sure that I wouldn’t get into the wrong line and end up causing a commotion. I had to go through the “green door”. My qualifications indicted that I had to be screened once I entered the “green door”. “Dear God!! What could I possibly have to endure?” The passport guy was intimidating enough!! I cautiously approached the green door, glanced around…no one else was even CLOSE to going through this door. I’d probably set off a series of alarms, guns would be drawn and K9 units would chew on my tuchus. (one of my best attributes!!) I pushed the door open, glanced around and looked at a guy sitting on a stool. I looked at him. Him at me, then he pointed to a gate for me to go through where (wait for it….) MACY WAS THERE!! Holy smokes!! Home free!! Well…not quite home free. We still had an hours-worth of bus and train rides to get across Berlin to my hotel. I was so tired but gave Macy what I had left in the form of hugs. After the bus and train rides we made our way up to my hotel, which was just a few blocks from where Macy lives, and checked in. I’m not sure how much English the hotel people know, but with Macy as my interpreter (she’s fluent in German) the transaction was done in German. I had booked the hotel on Expedia.com, which is quite easy. The view from my hotel window. It’s set in a quiet neighborhood. My room. It cost around $50 a night. 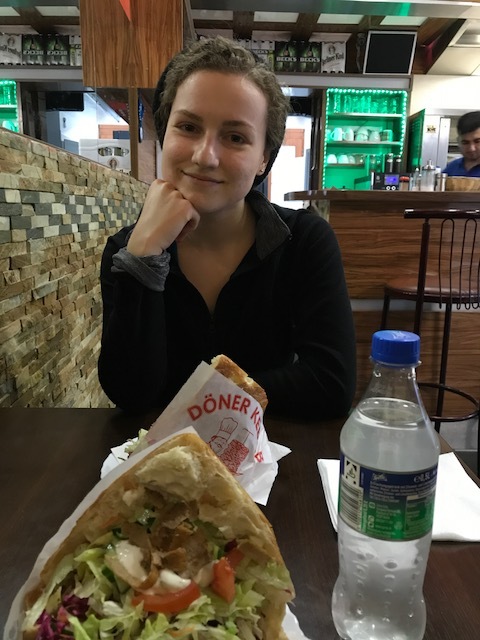 After quickly settling in we went out for supper at a….wait for it…TURKISH PLACE!! 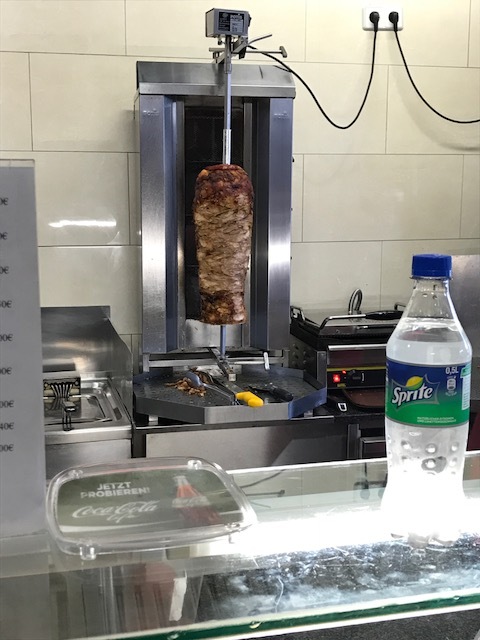 They have these gyro-like things that they call doner’s. Two words. DEE. LISH. Meat on a pole. MMmmmm….meat. Around the neighborhood that I stayed, and in fact, around Germany are “stumbling blocks”. Small, cobblestone sized brass memorials for those victims of the Holocaust. Every stumbling block has the name of the victim, the date of their birth and the date of death. 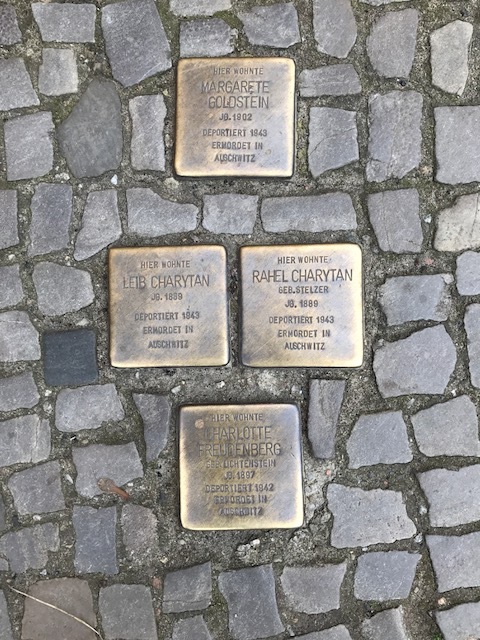 These blocks are set in the pavement of sidewalks in front of buildings where Nazi victims once lived or worked. There are around 25,000 stumbling blocks in 600 different cities around Germany. Its the worlds largest memorial, and its still growing. The name of the death camp is stamped on it as well. With supper finished I tell Macy that “its probably close to six or seven o’clock” and that I should retire for the evening and get some sleep, I’ve been awake for over thirty hours. She replied “its four o’clock in the afternoon Dad.” Regardless…I head to the hotel, take a hot relaxing shower, send out a few messages to family and fall asleep at seven, not waking up until six the next morning. The hardest part of the trip is over, I have four days with Macy in Berlin. Let the fun begin! Love your travel stories. 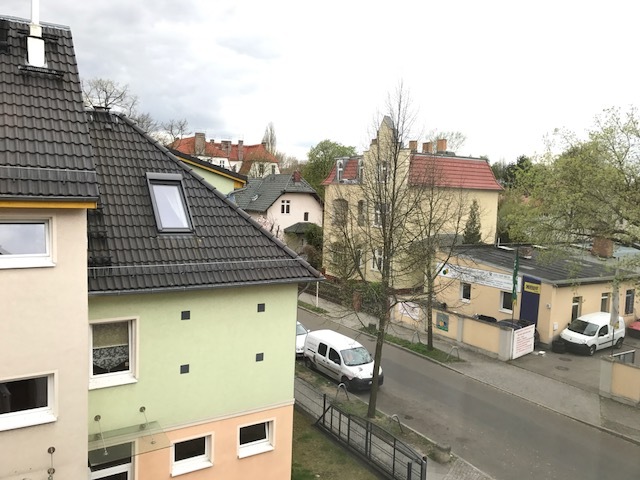 We lived in Germany for 4’years when I was in high school. Travelled a lot. My sister visited Berlin .& I Went to the Soviet Union ( with a busload of teachers). Have a great time! My love to Macy.